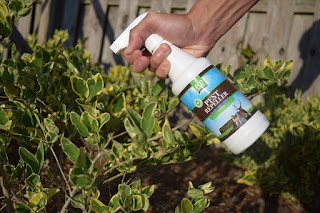 We don't have many problems with pests getting into our garden as of yet but to be safe we are going to give this a spray around our plants once the vegetables start coming in. 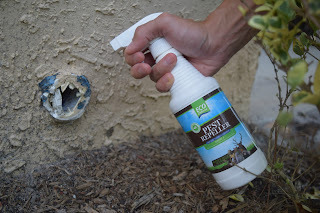 We do have a rat/mouse problem in the winter so we are going to give this a spray where we think they are getting into the house since the landlord still has not fixed the problem. They literally ransacked my pantry this last winter. What a mess they made. I won't be afraid to use this sine it is safe for my pets and children to be around with it being organic. No more worries in house or garden for us. You can purchase Eco Defense Pest Repeller on Amazon. What Eco Defense has to say about their product. 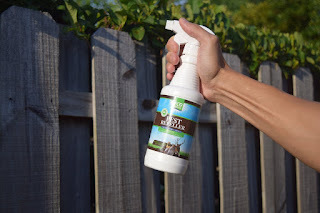 NATURALLY ELIMINATE PESTS FOR GOOD - All Natural Organic formula safely repels pests both in your home and around your house. Does not contain foul smelling ingredients typically used in "Natural" repellent products. Sprays easily and does not leave behind smells or residue. 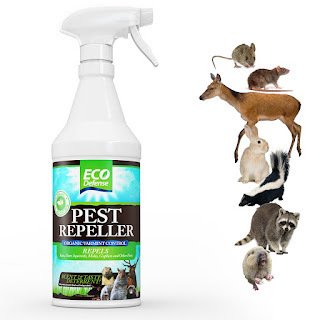 REPELS ALL KINDS OF PESTS - Specifically formulated to repel all types of pests including; Rats, Rabbits, Deer, Moles, Gophers, Squirrels, Raccoon's, Bats, Chipmunks, Birds, and many others causing problems to your home and property. Eco Defense is the most Natural and effective Pest & Animal Repellent on the market. USE ANYWHERE - Can be used both indoors and outdoors. Safely spray in cupboards, attics, basements or anywhere pests may be invading your home. Can be diluted to last twice as long or sprayed directly in problem areas containing heavy infestations. Use Outdoors anywhere around your yard and home to keep pests out. ECO-FRIENDLY AND SAFE - No harsh chemicals, traps, or poisons used here. Keeps pests away without having cleaning up trapped and poisoned rodents. Eco Defense can be sprayed in all areas of your home and without worry. Eco Defense uses 100% Natural & Organic Pest Control Ingredients that are safe for you and your family. Can even be sprayed directly on vegetation without harming your plants or your body. Finally keep rabbits, moles, and deer out of your garden for good. Disclosure: MarksvilleandMe received one or more of the products mentioned above as part of a promotion with Tomoson and Eco Defense. Regardless, MarksvilleandMe only recommends products or services we use personally and believe will be good for our readers. Some of the links in the article may be “affiliate links.” This means if you click on the link and purchase the item, I will receive compensation. If you would like MarksvilleandMe to review a product or service please contact us at marksvilleandme@gmail.com.